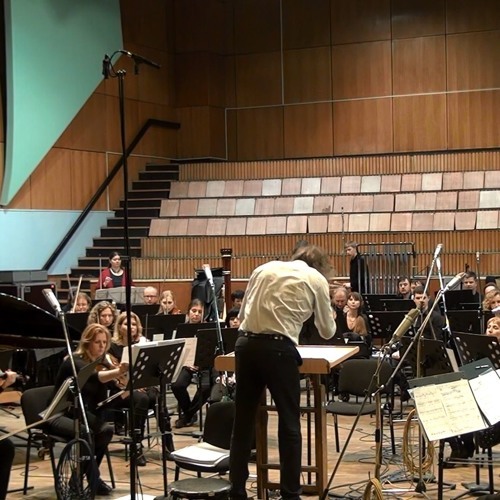 Olesya Rostovskaya - theremin Symphony orchestra of radio Orpheus, Conductor - Denis Kirpanev solo in the orchestra: Mikhail Busin - piano, celesta Elisey Dregalin - percussion “Déjà vu” [literally "already seen" in French] is a piece for symphony orchestra with solo part of Theremin. Theremin (or Theremin-vox) is the musical instrument invented in 1920s by soviet radio-engineer Lev Thermen. The musical sound is produced without a corporal contact, as reaction of an oscillator on the position of performer’s hands in the space relatively to two antennas – one for volume and another one for frequency. The instrument was very imaginative in the age of 1920-30s provoking futuristic expectation and ideas, and resonating with early soviet science fiction’s literature, cinematograph and theater (see Aelita, or The Decline of Mars and The Garin Death Ray by russian novelist Alexey Tolstoy). After the period of oblivion the Theremin-vox experiences a time of new interest with renovation of its constriction and image. The most known in Russia performer on theremin is Olesya Rostovskaya to whom this work is dedicated. The timbre and musical plastique of theremin have very powerful associations with artistic atmosphere of the age of futurism, so the listeners feel the acute sense of something very familiar and "already seen" - déjà vu. The composer did his best to demonstrate the versatility of instrument, including both its virtuosic capacities for performer and various acoustic effects - for example, imitation of bird's chattering in the coda. Usage of a number solo episodes for various instruments, including noisemaking and rhythmic percussions, delicate attitude to the orchestral density, numerous divisions of the strings, symmetry and fractality, Klangfarbenmelodie and canons (often hidden in the orchestral texture) - all this resources are combined for creating a special ambience, timbre colors and shades for theremin.